In just two days, we'll be driving south to Paonia, Colorado for a long weekend getaway. 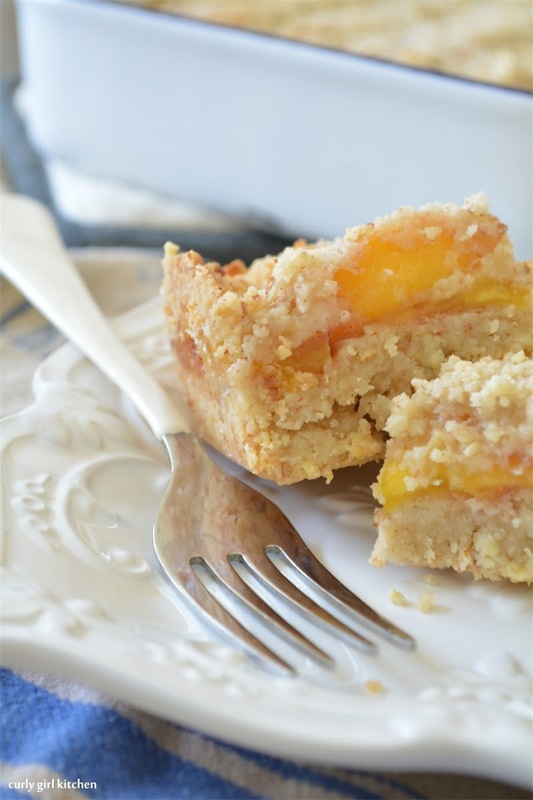 Since we'll be in wine and peach country, it seemed only right to share this recipe for peach almond crumble shortbread bars. 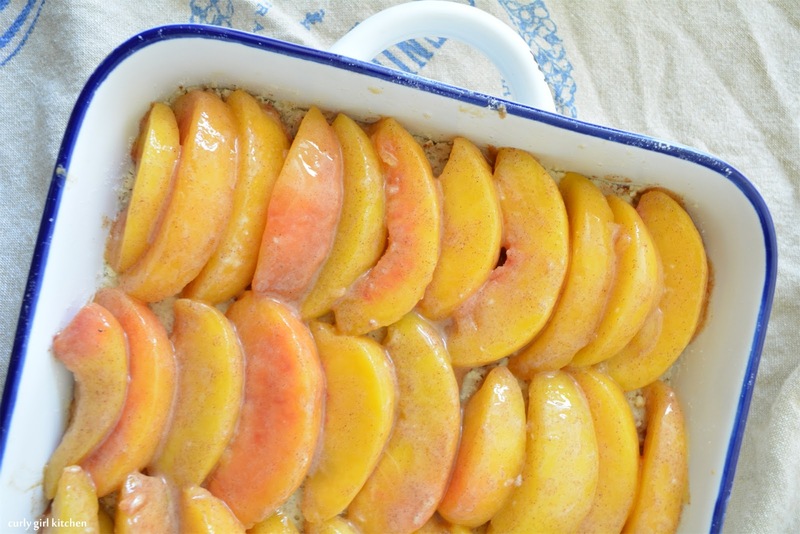 The peach bars, with their buttery shortbread crust and crumble topping and juicy peach filling were fantastic. A taste of summer. There are few things I like more in the summer than a fresh peach, on its own, sliced on top of Honey Nut Cheerios, or sprinkled with cinnamon and topped with a dollop of Greek yogurt or a splash of cream. 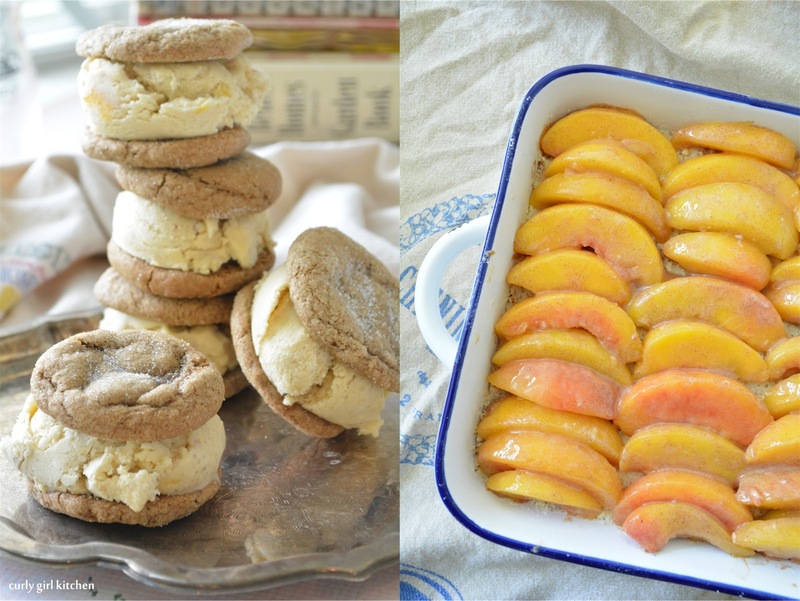 I loved the almonds in the shortbread, and the almond extract tossed with the peaches, but almond-anything always wins me over. My husband, though, not so much. He thinks the flavor is too strong, and that it overpowered the taste of the peaches. Either way, it's all personal preference, and they can certainly be left out of this recipe. But since I couldn't eat the whole pan of peach bars on my own, I turned them into something I knew he would like - ice cream. 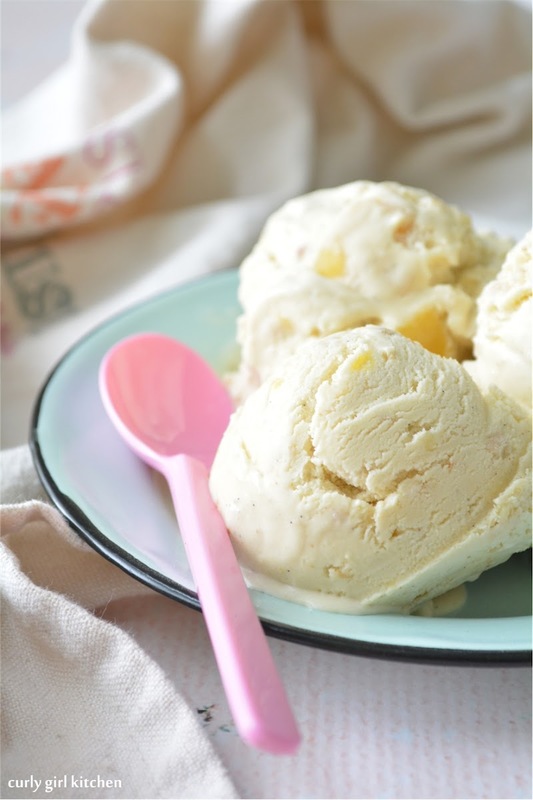 The vanilla bean custard is a classic ice cream base, and beautiful in its simplicity, but it was pretty wonderful with the crumbled peach bars folded in. 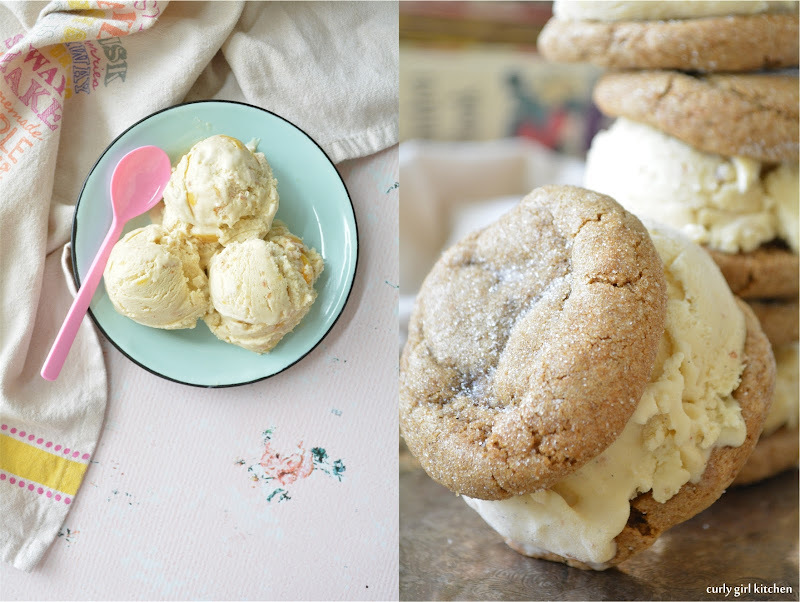 But I couldn't stop there, because, cookie ice cream sandwiches are even better than just scoops of ice cream and a spoon. Remember the gingerbread house I made at Christmas? I had frozen a bit of leftover gingerbread dough in December, so I thawed that out, added a little water to make the dough more pliable for cookies rather than a stiff gingerbread house, rolled it up into balls, coated them in sugar, and baked them until just barely cooked. Which is how I like my cookies. Soft and underdone. 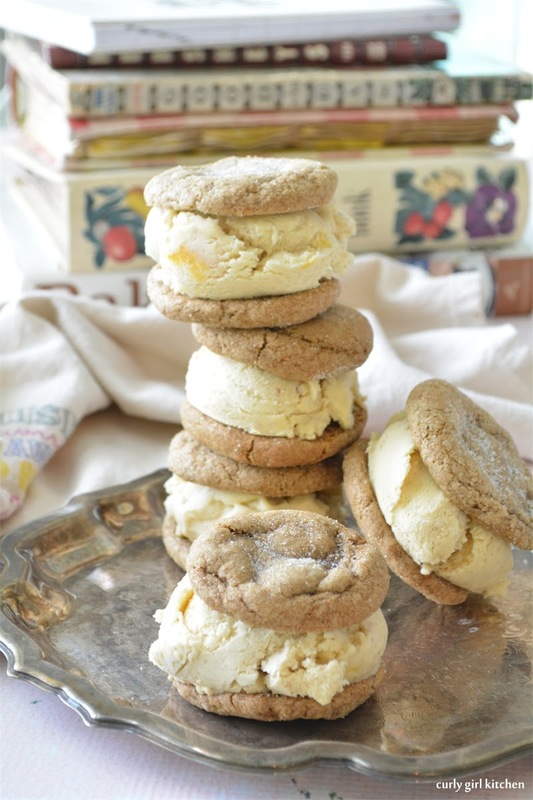 The soft, sparkling ginger cookies paired beautifully with the ice cream, and sure enough, Jamie ate every last cookie ice cream sandwich. Preheat the oven to 350. In a food processor, combine the almonds, flour, sugar and salt and pulse until the almonds are finely ground. Add the butter, a few pieces at a time, and pulse just until moist and crumbly. Reserve 1 cup of the crumbs and spread the remainder in a greased 8x8 baking dish. Bake for 15 minutes. 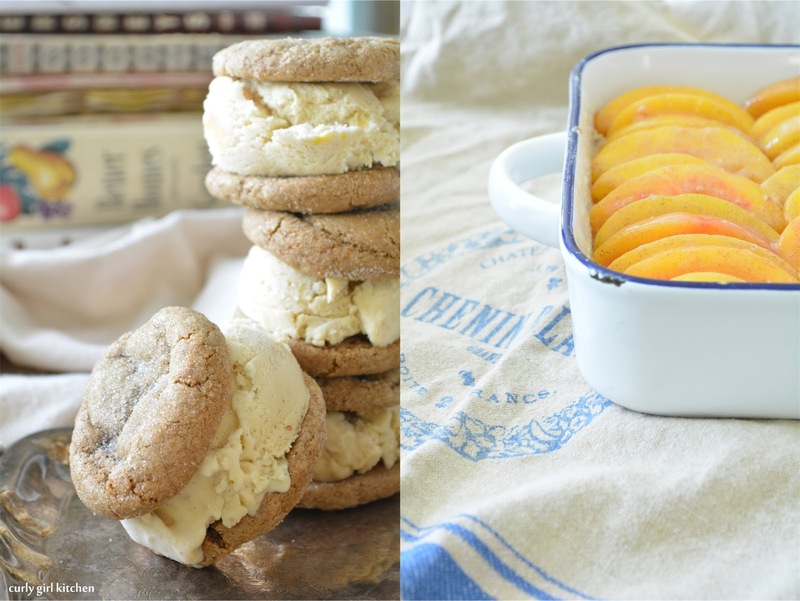 Meanwhile, toss the peaches with the flour, sugar, cinnamon and extract. Arrange the peaches over the hot crust. Sprinkle with the reserved crumbs. Bake for about 35 minutes, until the topping is golden brown. Cool completely before cutting into bars. In a large saucepan, whisk together the cream and milk. Bring to a gentle simmer over medium low heat. In another bowl, whisk together the egg yolks and sugar. Slowly drizzle about a cup of the hot cream into the egg yolks and whisk to temper the eggs, then scrape the mixture back into the saucepan. Cook the custard over medium heat, whisking constantly, until thick enough to coat a spoon. Remove from the heat and whisk in the salt, butter, vanilla and bourbon. Pour through a fine mesh strainer to remove any bits of cooked eggs. Cover with plastic and refrigerate overnight. 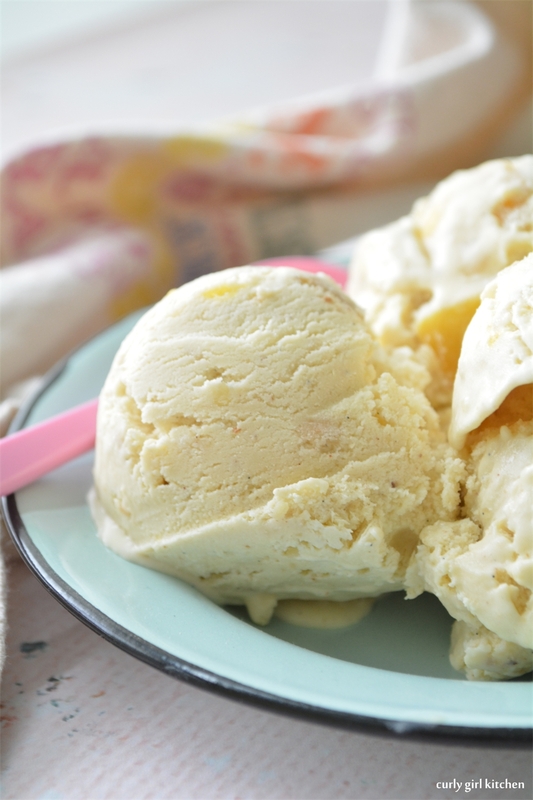 Churn the ice cream according to the manufacturer's instructions of your ice cream maker. 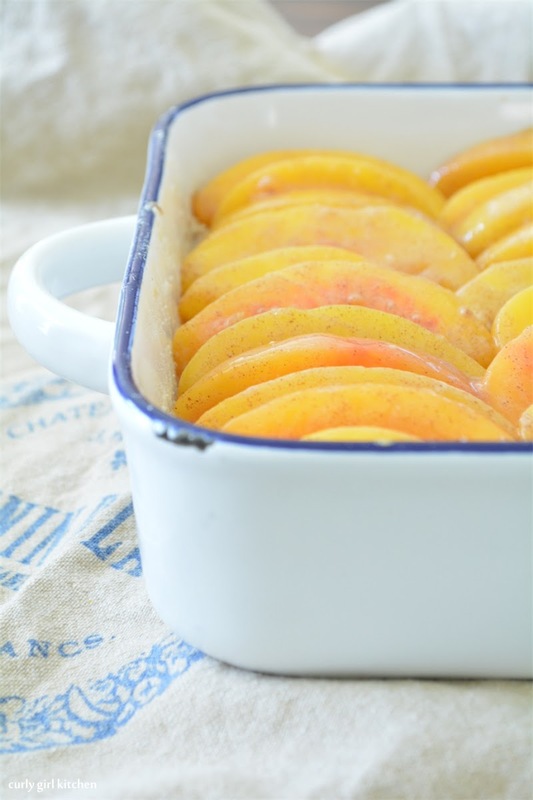 Fold in the leftover peach bars, then spoon into a container and freeze until firm, about 4-6 hours. Yields about 2 quarts of ice cream.